What is the literacy background of your students' families? Are they active advocates, willing waiters, or carelessly uninvolved? Learn how to best approach each type of parent and involve them in their child's literacy learning. Included: Tips for approaching parents. Do you want improved student test scores and, just as importantly, students who love to read? Don't belittle the impact of parents. Any mom or dad can enjoy positive experiences with children and books. Convince without intimidating, encourage without judging, and never make it boring! Does the student know how print works, and enjoy reading? How do the student and his or her family interact with print? Does the family own or borrow books? Reads regularly with their children. Want to help but donât know how. Seems to have no time nor do they see a need to âdo the teacherâs jobâ. From a young age, these parents surround kids with sound, language and print. May have had no positive reading models. May be preoccupied with their own struggles and rarely interact with the school. Talk with their children, not at them. Feel ill equipped or unsettled by the idea of contributing to âan educational experience.â People who donât speak or read English may appear here. Allow extra space below each heading to print individual student/family names. Put every family in the category that describes them best. Now you have the basis for a system. Remember that all parents have one thing in common: a child whose life can be enriched with the power of reading. Try the following strategies with families in each group. Offer to answer specific questions and share additional resources. Ask them to befriend a family in the "Doesn't Seem to Care" category and invite them to the Book Fair's Parent Night or the public library. These parents need more guidance and direction. Remember, they can easily feel threatened. Don't use education terms -- phonemic awareness, comprehension strategies, and early intervention are out! Send home book bags, games, reading incentives, or assignments that they can do with their kids. Concentrate on positive, pleasurable experiences -- no drills or worksheets. Plan a no-pressure icebreaker and include fun, food, and festivities (not lectures on what they should do). Read a delicious story and build a level of trust before you instruct. Most parents love their children. These families simply might be overwhelmed by life's circumstances or have little understanding of the doorway that literacy can be. Gently guide them from one level to the next. Start with five minutes listening to their child retell a story. 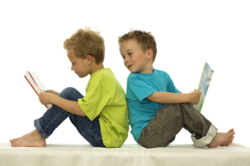 Encourage them to find a quiet place for the child to read and do homework. Show a genuine interest. Listen to their dreams for their child and explain how literacy can contribute. Invite them to your class with no assigned role except honored guest. They might sit with their child and listen, or interact with children as they learn. Understanding what happens in today's learning environment is the focus. Most don't-seem-to-care parents do care deeply; they simply see learning as foreign, scary or boring. Take that threat away and you have another literacy advocate. Already-busy educators easily can involve parents in the literacy loop with this system. Consistency and layering are the key; the more often you interact with parents on this level, the more parents will step into your literacy loop. Ask your grade level team to add their own ideas for involving each parent type in the process of their children learning to read and becoming better readers.